Spiritual Business tells stories from the life of a wandering mendicant, which taught him how to organize his material life, and he was ultimately blessed with such success, that he was able to finance a series of ashrams around the world, as well as the spiritual pursuits of a number of seekers by following the rules of financial analysis and stock trading. As well as being an entertaining presentation of fundamental analysis for investments, the App also defines technical trading indicators, and shows how to employ them. It includes videos, links to free online classes, and it is a fabulous resource for anyone trying to harmonize their spiritual life with their material responsibilities. He practiced the recitation of the Chandi Path in the Himalayan snow and in the hot springs of Bakreswar. Through this rigorous penance, he became impervious to the influences of heat and cold. Through his experiences walking the length and breadth of the Himalayas over 15 years, Swamiji fell in love with Sanskrit and became proficient in numerous languages including Bengali and Hindi. Wherever he went he would learn the local systems of worship and inspire those around him to participate. Swamiji’s expertise and experience spans many different religious traditions. Swami was educated in the United States with a background in Accounting and Law, and he worked for several major corporations before deciding to lead a spiritual life. After joining a monastic order, he soon found that the same economic rules applied to spiritual people as they do to all people everywhere: that we must each assume our own responsibility to add value to the society, or we will quickly risk becoming a burden and incurring resentment. Swami began to apply his understanding of financial analysis for the benefit of the spiritual community, and the ashram grew, as well as the philanthropic activities of the community. Today the Devi Mandir branch of the Saraswati order manages financial resources around the world and contributes to the empowerment of their non-profit goals. 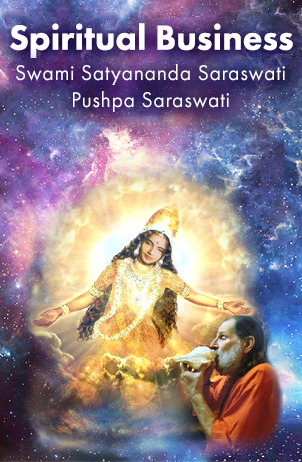 In this book and App Swamiji and Pushpa tell how they empowered the community with instructions on how to read financial statements, how to perform fundamental analysis, and how to apply technical indicators, so that they could lead a spiritual life of worship and prayer, while providing material support to the entire community. It is their thesis that by providing financing for business enterprises, they are encouraging innovation, creating employment opportunities, improving standards of living, and adding to the sustenance of their community — all great benefits. In this work they tell how they are doing just that, and how you can do it too! “When I read the beginning pages I could barely make out the words my eyes were so full of loving and inspiring tears!!!! Vivek and I actually have a date this morning to re-do step one- Goal setting. We are always evolving so it’s so improtant to go back and check our goals to see what has been accomplished and what needs to be refined!